Thursday dawn May 10, I drove against the commute traffic out of the SF Bay Area, across the valley past Tracy, Manteca, Escalon, Oakdale, up into the foothills through Jamestown then Sonora, and up away from our urban worlds into the Sierra Nevada on SR108. 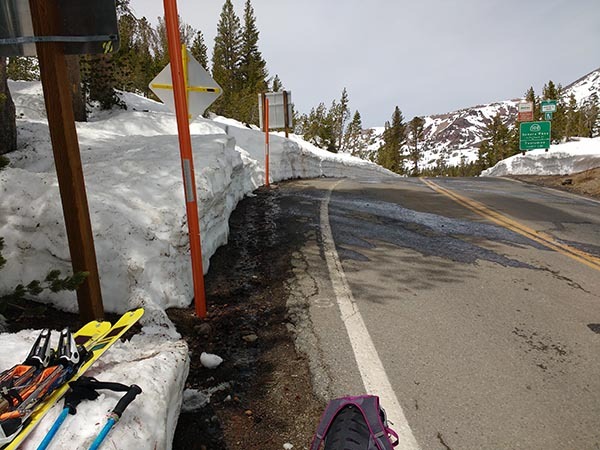 At 5600 feet, the Middle Fork of the Stanislaus River was not at all clear, roiling high with snow melt carrying volcanic sediments while snow was absent even in shadiest roadside areas. However beyond the 8000 foot highway sign, patches of snow increasingly appeared with much all along the highway at 8500 as the road climbed steeply past Blue Canyon. A prime reason for this road trip would be to check out backcountry DayMaker ski binding adapters I had recently purchased so had brought along two of my three pairs of skis plus a pile of other skiing gear. I expected to spend time mid day at Sonora Pass at 9643 feet skiing up and skiing down slopes as the pass had just opened up a week before. 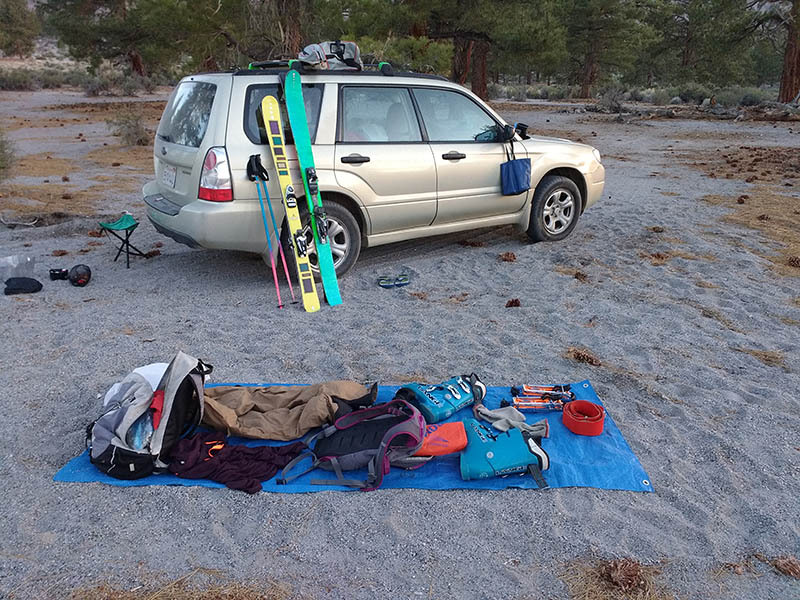 My car was bulging with more gear than on usual road trips with the long skis limiting how I could arrange items. At the pass, I spent a few hours becoming familiar with installing the binding adapters and putting my old Pocoma climbing skins, I had recently reglued, onto my two pairs of skis. I went out twice climbing up a variety of slopes a few hundred feet then skiing down. A couple other cars with backcountry skiing enthusiast were also along the highway. Temperature was balmy at 52F with increasing cumulus buildups making for flat light conditions so none of my smartphone images had a chance of showing ski tracks in the snow and their dark clouds hinted at possible thunderstorms I did not want to get caught in. So by mid afternoon I had packed up my ski gear and continued driving east, noting the Walker River was also roiling high with murky sediments. At US395 I drove south and then at Conway Summit drove up the Virginia Lakes Road, where more backcountry skiing enthusiasts were at the 9850 foot parking lot. Snow was patchy above 9000 feet while there was plenty of snow below 10000 feet on northern exposures. I drove on south down into the Mono Lake Basin that I expected to work photography at in between any skiing. 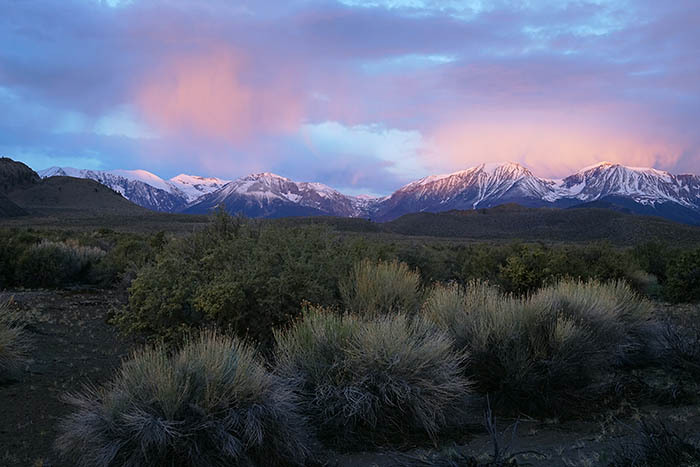 After topping off gas and picking up some perishables at the Mobile Mart, that evening drove east on SR120 then out on a favorite obscure dirt road to a lonely sagebrush and jeffrey pine camp spot with a view of Mono Lake and Sierra peaks from Gibbs to Dunderberg plus the Sweetwaters. The whole basin is covered by deep pumice and obsidian sands from Mono Craters geologically recent rhyolite volcanic eruptions that makes for pleasantly soft surfaces for inside tent sleeping. In fact Negit and Paoha Islands in Mono Lake are less than 2000 years old with the most recent lava flows a mere 300 years old. However during May and early June there may also be no-see-um biting gnats about early morning or late afternoon into the evening, so I set up my Forester for usual sleeping in the rear bed. Instead of rearranging the considerable gear inside as I normally do for roadside sleeping in the car, I moved much of the gear outside onto the top of a blue plastic tarp. The above image shows my MSR Whisperlite stove set up at frame left as I was cooking some soup. Afterward I had some usual fun for an hour while dusk skies offered some of the best red color I'd experienced in years. However I was not in position to work any photography so just enjoyed the colorful views. Skies were mostly clear and sunny at sunrise Friday May 11 as I rose then put gear back into the Subaru. With the temperature at 7000 feet in the low 40Fs, I expected snow at Tioga Pass had dipped to near freezing. I drove back to Lee Vining then west up SR120 that had just opened a few days earlier to the Yosemite National Park boundary at Tioga Pass at 9943 feet. About a dozen cvehicles with backcountry skiers were along the highway above Ellery Lake at 9500 feet. A brisk wind was blowing from the west over the pass with temperatures at 9500 feet 35F. I watched 2 men cclimbing with skins on skis having a difficult time moving across a steep obviously frozen hard slope up near the mouth of Dana Canyon. Outside, the few foot depth of road side snow was rock hard as a mass of several feet of snow colder than air temperatures will at night freeze solid snow surfaces despite slightly higher air temperatures. Weather did not seem likely to repeat the balmy conditions I had found at Sonora Pass the day before and rather snow surfaces would likely stay frozen. So I decided to instead drive back down to Mono Lake and get into some photography work. I drove back down to US395 then out east on SR120 where I explored a number of dirt roads then later the Navy Beach area. Wind kept increasing so I would not be doing any photography. In the afternoon I set camp back up where I had camped Thursday, however after a 2 hour nap awoke to dark cloudy skies with obvious showers in the distance to the north across Mono Lake. None of this had been in the weather forecast so I expected an inside slider cold front that was supposed to move east across Oregon had instead vectored southeast into the Nevada Great Basin. After wondering what to do a short while, given temperatures had dropped to 40F, decided snow might soon occur and as I did not want to be stuck on a remote dirt road, packed gear back up then drove out back to US395 and into Lee Vining where I enjoyed a most enjoyable cheeseburger at the Mono Cone. Then drove back south and onto the June Lake Loop road where I soon drove out a short ways on a gravel spur road to a dead end along Rush Creek at 7100 feet. By time I arranged gear inside the Forester, the 7pm skies had become very dark, the temperature was 38F, and blustery sleet was falling. I was soon safely inside and warm beneath my -5 degree goose down REI sleeping bag that I use like a blanket, then quickly went to sleep. By midnight the cold front had passed with stars above in the sky and a dusting of snow covering nearby vegetation. By dawn Saturday May 12, views west towards Mount Wood and Lewis showed slopes above 8k blanketed with snow. Above were mostly clear skies with a cold 26F temperature outside my car. I bundled up putting on my warmest clothing. By this time it was evident I would not be doing any more skiing on this trip. Although there might be a few inches of new snow up by the pass, it would not have enough depth above the frozen snow surface below to be pleasant, what skiers refer to as "dust on crust". 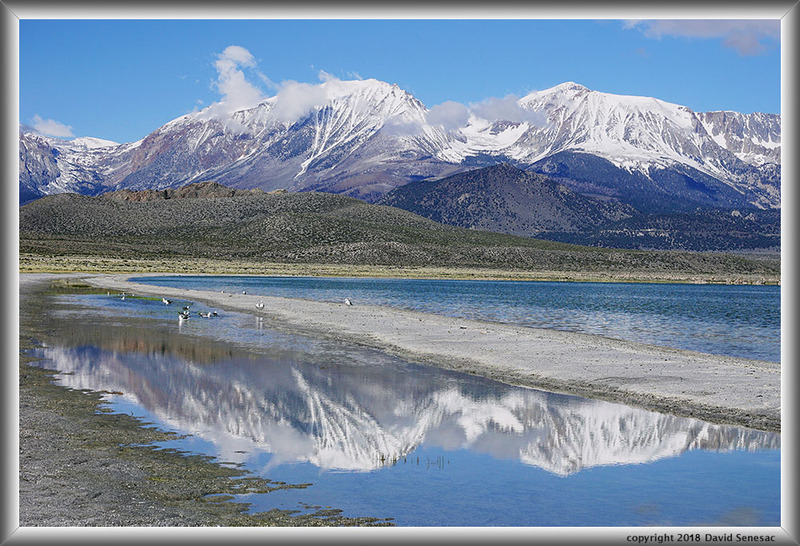 I quickly drove east on SR120 to the east end of Big Sand Flat at 8000 feet where I had surveyed good views to the Sierra Crest to the west. As I grabbed my photo gear and got outside, the air temperature showed a frigid 17F degrees. There per image above using my 60mm lens took a set of shots for a 5 column horizontal panorama of 22400 by 4000 pixels. Foreground sagebrush, rabbitbush, and bitterbrush had a white dusting of snow with Sierra peaks at the skyline frame left to right including, Two Teats, Mt Ritter, Banner Pk, Mount Davis, Rogers Peak, Mt Lyell, Mt Wood, Mt Lewis, Mt Gibbs, Mt Dana, Mt Warren, Black Mtn, and Dunderberg Pk. The below 4 crops from the above image are 50% pixels downsized showing its considerable detail as well as demonstrating how aesthetically inadequate it is displaying large images that have been downsized on the Internet. Of course a full 50mb image would take too long to load into most user's devices and then anyone could just copy stealing otherwise copyrighted work. 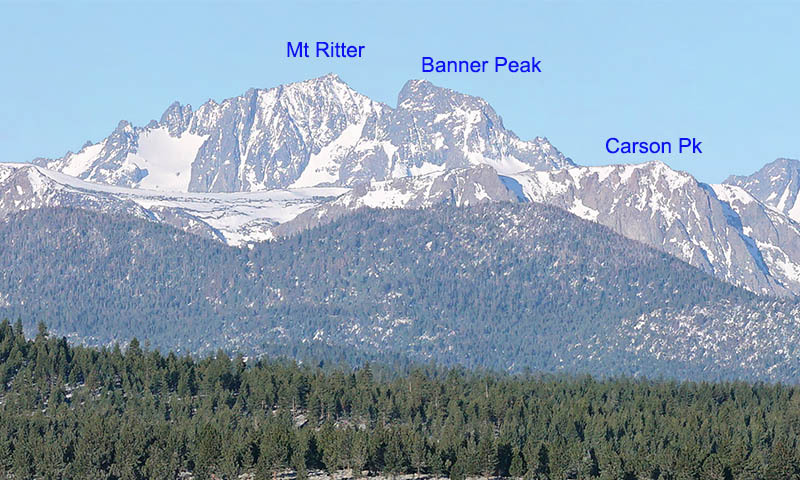 This first crop above shows Mt Ritter at 13142 feet and Banner Peak. A group of us hiked from our camp at Summit to the top of Carson Peak during July 1989 that is about 5 miles closer than Ritter. Almost all trees in these forests east of US395 including those about Mono Craters, are drought resistant jeffrey pines. The lower elevation gap in the Sierra Nevada range at Mammoth Mountain allows greater storm precipitation out into the areas east of the range that is enough to support these trees. The above shows Mt Woods. Although there had been snow on these peaks before the storm, now snow delineated favored slopes, especially gullies providing better visual character. 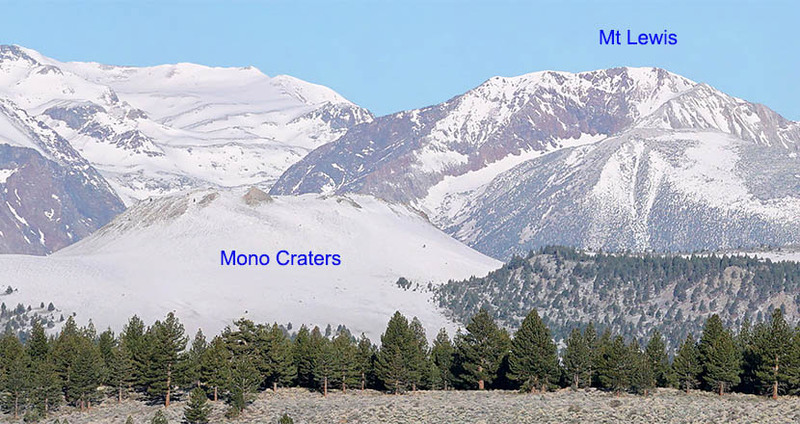 Miles closer, the bizarre lava landforms of Mono Craters peaks were all now decked out with snow too with its highest point, Crater Mtn at 9172 feet showing a solid layer of snow likely several inches deep. Interesting by the end of this day, most of the snows would melt due to the warm ground temperatures. Despite being exceptionally clear dry air behind the passing front, at 19 miles distance, scattering from oxygen molecules was enough to soften the distant features with a slight blue cast. Next is Mt Lewis at 12234 feet about 19 miles distant with one of the Mono Craters at 9110+ feet, much closer fully blanketed by the May snow storm. Now that would be a fine slope to lay a set of powder turns down. Almost all that snow would melt in just a few hours. And this fourth crop above shows the Mt Gibbs through Mt Dana section. The canyon below Dana holds one of the largest rock glaciers in the range. 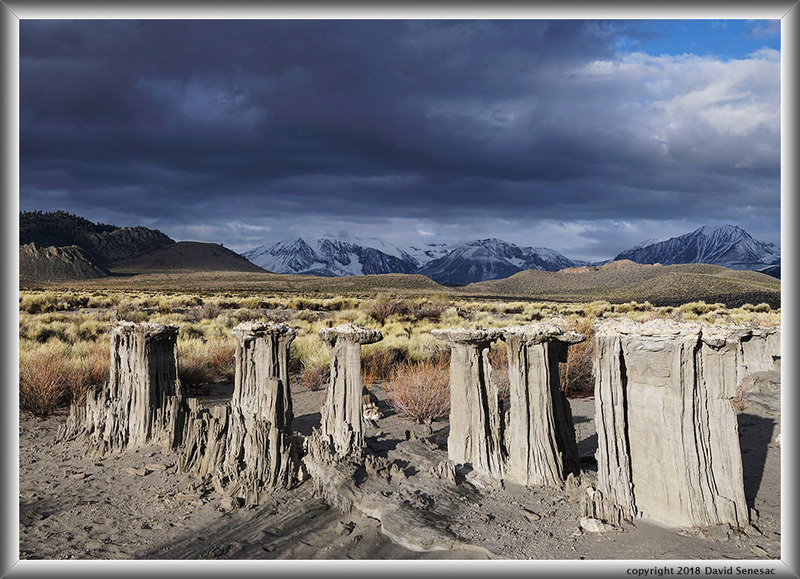 I drove back west on SR120 then onto a dirt road I had explored windy Friday with views north towards Mono Lake where at 8:40am I set up the above 4 column stitch blend image. Notice the waves on the lake, as a breeze had already developed over the lake waters though had not yet reached my position. At night, air at crest elevations is chilled by clear sky radiation cooling becoming heavy, then flows down Lundy, Lee Vining, and Rush Creek canyons and out onto the lake surfaces. The lake's current level is 6381 feet or 36 feet below the level when Los Angeles began stealing its tributary waters. 12374 foot Dunderberg Peak is at mid frame right. Behind Paoha Island at mid frame right is the dark bump of smaller Negit Island. Off behind the left west end of Paoha is Black Point. And far in the distance behind the right side of the island at a bit more than 40 miles distance, is the Sweetwater Range with its highest peak Mt Patterson at 11673 feet, obviously with much more white after the previous evenings snow storm. 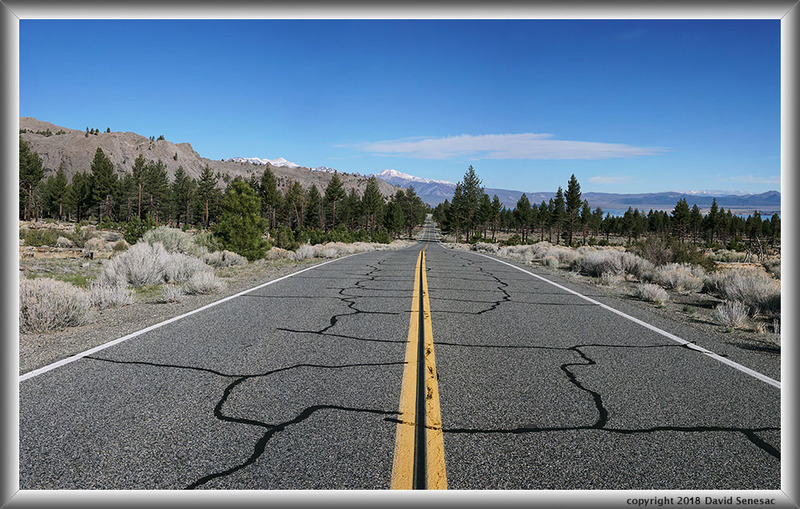 Back on SR120, I moved to a location I'd surveyed with an interesting view down a straight stretch of highway with a bit of Mono Lake's blue waters behind. Be sure to check the full yellow stripe with the enlarged vertical slice view below this image. After working some subjects on a large sand expanse, breezes arrived so pointed my A6000 down at some pussypaws, calyptridum umbellatum, a favorite low to the ground wildflower that is little affected by minor breezes and is found at sandy areas across a wide range of mountain environments. 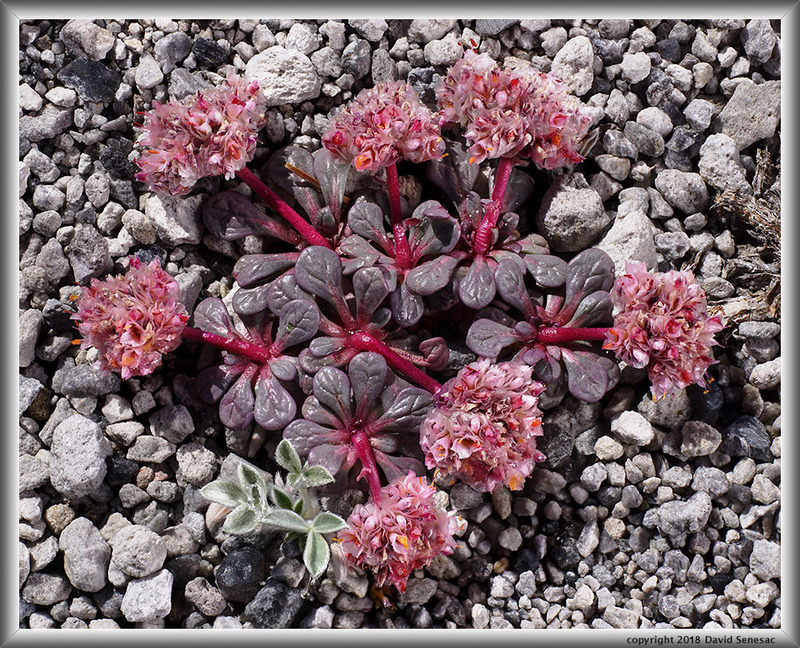 Here shot with a diffusion disk, the plant is amidst small white hued pumice and black hued obsidian stones. Note dew drops still on leaves and wonderfully red stems. The leaves of plants in this region are a dark reddish green versus the more common green. The light green leaves of the plant below, is a dwarf lupine that will flower in a couple more weeks. And another pussypaws is in the image above but this one with my lens focused closer after adding a 12mm extension tube. These flowers on sunny sand flats were among the few earliest rising this spring while I expect to see a great many more wildflowers from a list of species on my return trip at month end. 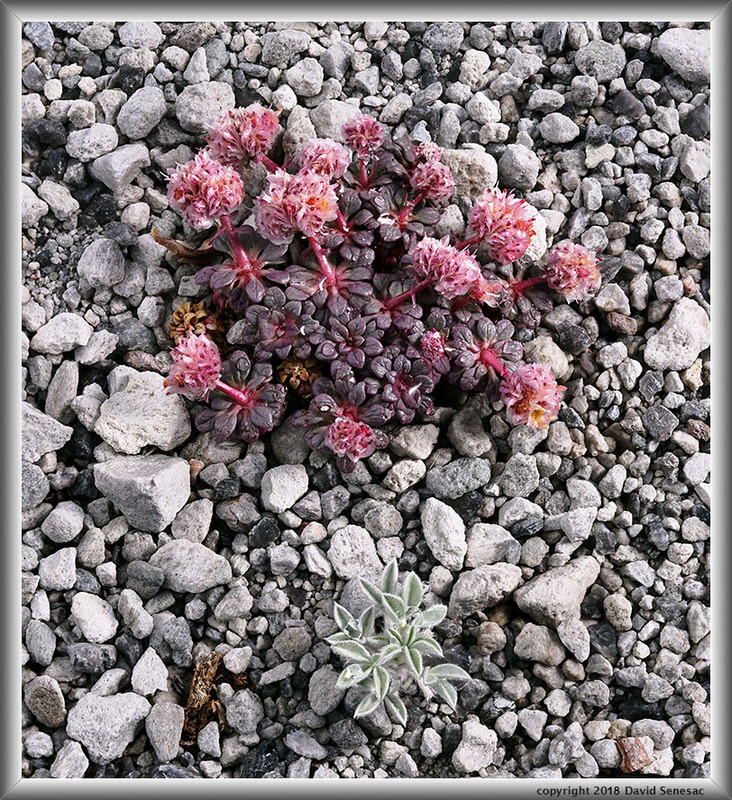 The most common blooming plant in Mono Basin was bitterbush that has an abundance of small yellow slightly green flowers and is found in the sagebrush steppe expanses along with rabbitbush. On the above image, some can be seen in the distance near the top of the hill frame right. 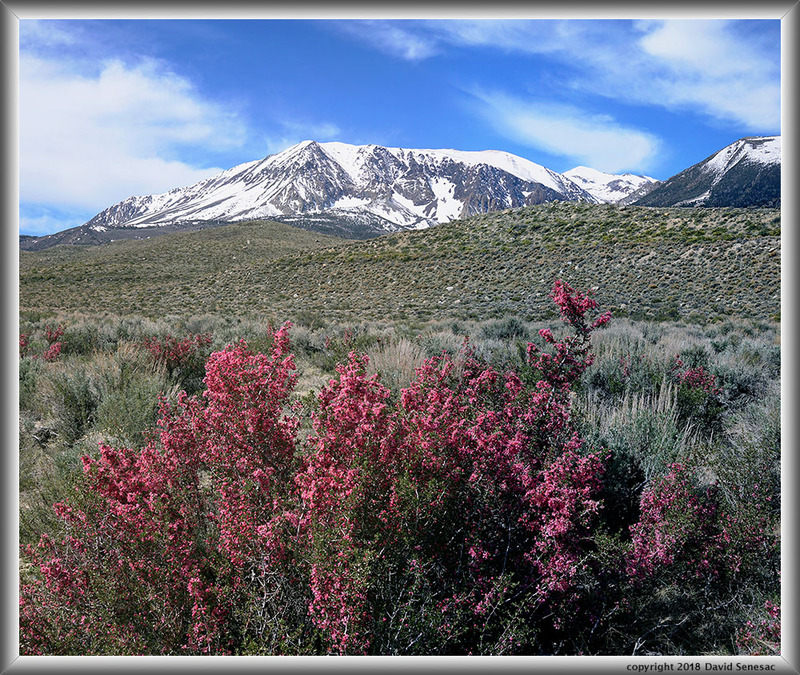 In the image foreground is another early blooming shrub, a spectacular desert peach, prunus andersonii, against a background of sagebrush steppe covered glacial moraine hills descending from the Parker Creek canyon with snowy Mount Wood above at frame mid left. Further along that same spur ridge is Parker Peak then in the background mid right, Koip Peak at 12962 feet. Behind the moraine hills is Parker Lake, one of just a few natural lakes at these lower sagebrush elevations on the east side of the Sierra. One will find the desert peach scattered about these sagebrush steppe slopes especially within a few hundred yards of permanent streams. On the left flank of Mt Wood is one of the Sierra's largest aspen groves accessed by an unpleasant 4WD road my Forester can just handle the clearance for. Maybe next year in May, I will skin up those modest gradient slopes to about 10600 feet then ski down over a thousand feet vertical through its dormant aspen groves. 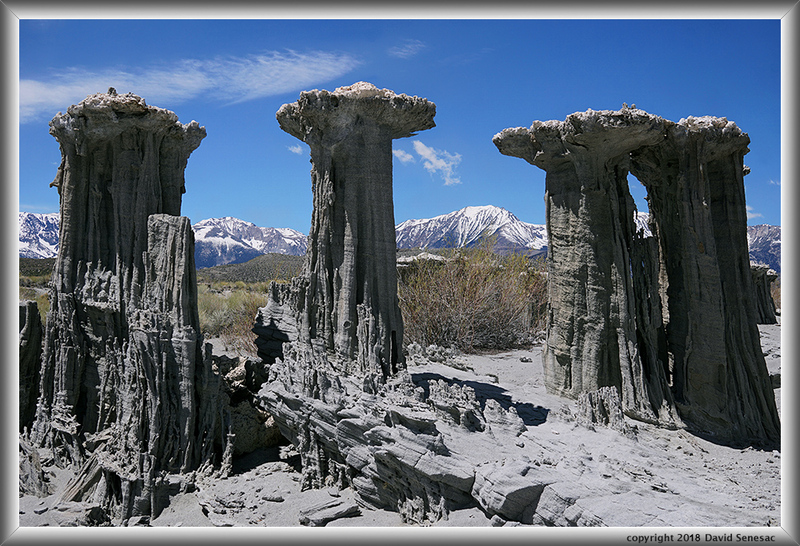 Continuing west, I drove down the Navy Beach Road and stopped at the most visited sand tufa area where many of the tall sand tufa structures are capped by hard bright white limestone. 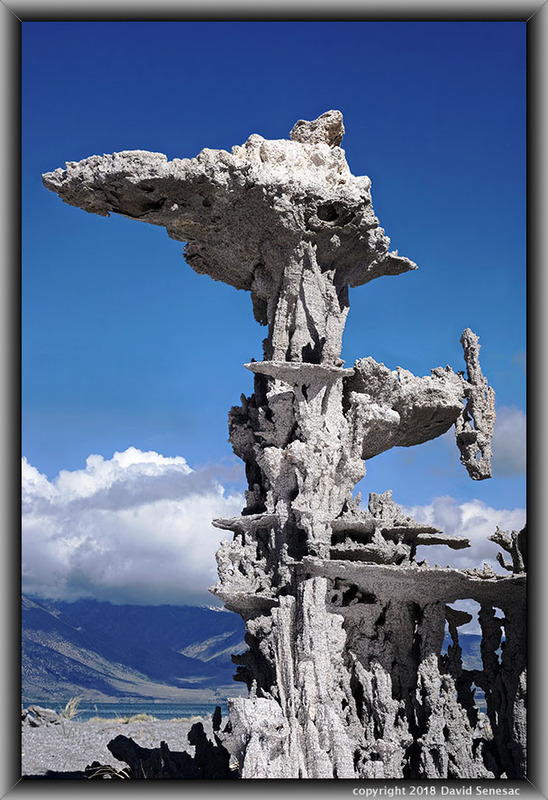 Sand tufas, unlike the limestone towers at popular nearby South Tufa, form when freshwater springs rich with calcium carbonate erupt through alkaline fluids in lake bottom quartz sand sediments creating cemented sand around the water column. Later when lake levels drop, weather elements of wind, rain, and flowing water erode away softer sand leaving a thin hard cemented sand layer that can be tubular, hollow inside, and rather delicate. The above image view is looking down on the top of such hollow structures. 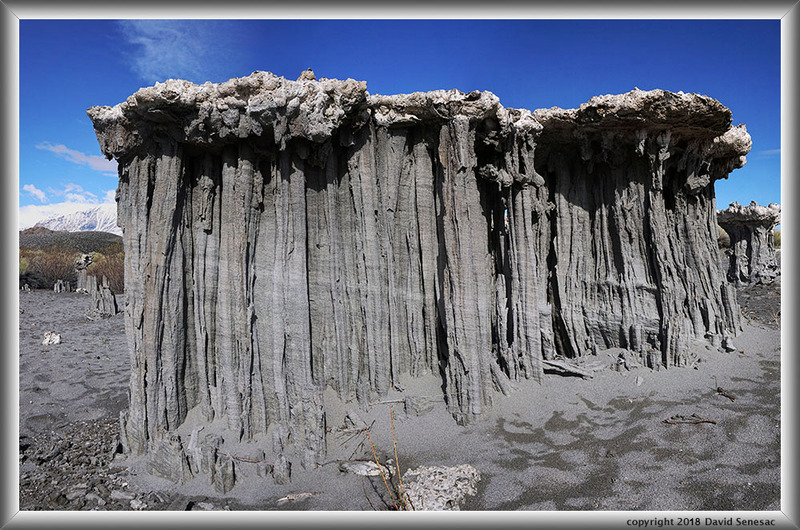 On this image, the sand tufas are capped by hard limestone that was at that time the lake bottom where the emerging fresh water rich with calcium carbonate reacted chemically with the alkaline soda lake water. For the above, I positioned my camera low to the ground to put the tops of the towers up against the blue sky with snowy Mt Lewis and Mt Gibbs between to two sets of tufas. The afternoon became mostly cloudy and by late afternoon darker clouds with showers moving from northwest by west moved across the north side of the lake that by sunset had reached the south end of the lake. I parked to overnight off a spur road along the Navy Beach gravel road and before sunset rain began that must have dropped about a half inch during the evening. Sunday May 13, began with a solid cloud deck above the lake with the early rising sun to the east shining across beneath. I rose early, rearranged gear, drove a short distance, parked, then revisited the sand tufa area in better light than on Saturday. Peaks to the west showed snow once again had apparently during the evening fallen down to about the 8000 foot level. While the sun was still below the cloud deck at 7:10am, I shot the above 2 column focus stack stitch blend set with the same subject I had shot up in the sky on Saturday but with warm light providing a better background to bring out their 3-dimensional forms and dramatic dark clouds shadowing the background. Poking up in sunlight behind a sagebrush covered hill at frame right is Panum Crater. Areas of sun and with cloud moved overhead as I worked more sand tufa subjects, however results lacked adequate 3 dimension quality. At 9:15am shot the above wall of sand tufas up against blue sky. Note the still wet sands from the previous evening's rains. One aesthetic issue photographing the sand tufa is visitors will leave sand foot prints as they walk around the structures. One is more likely to experience less footprints near subjects during this earlier period of spring. In any case footprints in these sands do not smooth out easily even after weeks of winter weather. I've left out several sand tufa subjects that I worked due to unnatural footprints in frames that I personally find objectionable. At 13 miles long and 9.3 miles wide, strong winds across Mono Lake can generate sizeable waves that push around volcanic sands along many of its shores creating sand spits with quieter ponding water behind. Capturing a good reflection along the main lake shore is uncommon however such occurs frequently mid mornings in the narrow sand spit ponds after night canyon flows wane. Also on afternoons with cumulus buildups, winds are often are erratic and may also calm up briefly. The above image at 9am was during a brief period of near calm while one will note the main lake was still wavy. Although capturing such an image with a better reflection plus gulls would not be too uncommon, capturing such just after a fresh May snow storm is uncommon. At mid ground are several California gulls, larus californicus, of which about 50,000 breed on Mono Lake islands each spring. These birds migrate from the Pacific Coast as the cold of winter wanes and the myriad alkali flies begin to emerge. While keeping a wary eye towards people, the gulls seem to sense when someone like this photographer are not paying attention to them, then go about their business. At the far right frame edge is the popular South Tufa area. At left frame edge is Bloody Canyon with Mt Gibbs at center and Mt Dana at right. Each May some elite backcountry skiers using crampons and ice axes, climb up to the top of those white faces then ski down the larger narrow snow filled gullies. 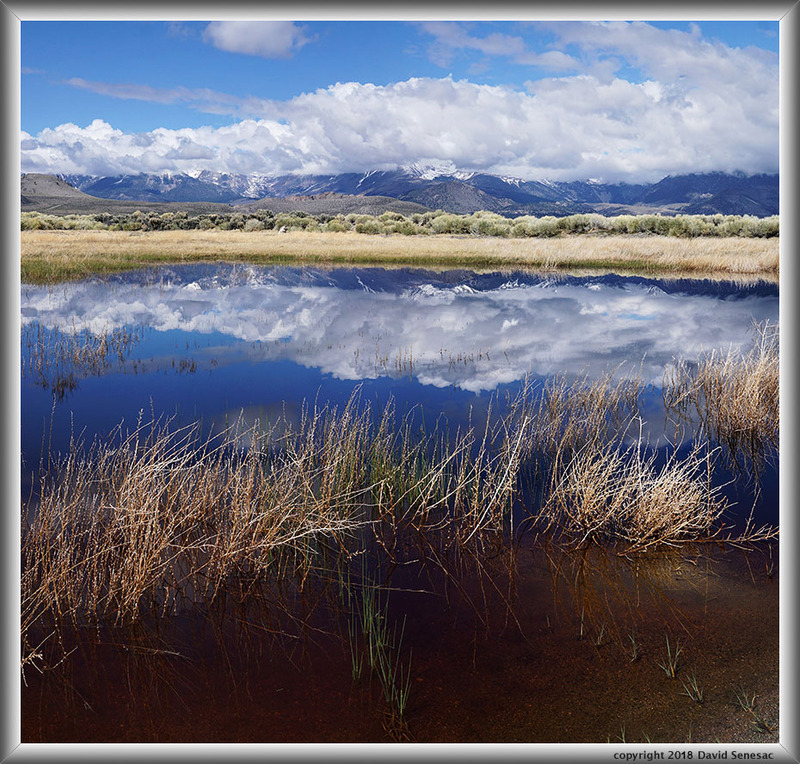 By 10am I was well east down the south shore of Mono Lake where the first of many freshwater marsh ponds exist. Much fallen precipitation within Mono Basin flows underground through the porous volcanic geology down towards the lake since it has the lowest elevation in the basin, thus creating marshy areas near shorelines as well as building tufa formations when rising beneath the lake. The breeze was nicely waning allowing the reflection at page top towards the snowy Sierra Crest while much of the crest was buried below cumulus. The pond contained considerable decaying organic matter causing dark sepia color waters. Along the shore, water was rich with small invertebrates and even a few frog tadpoles. Behind the pond are dormant during winter blond hued grasses that are in the process of greening up. 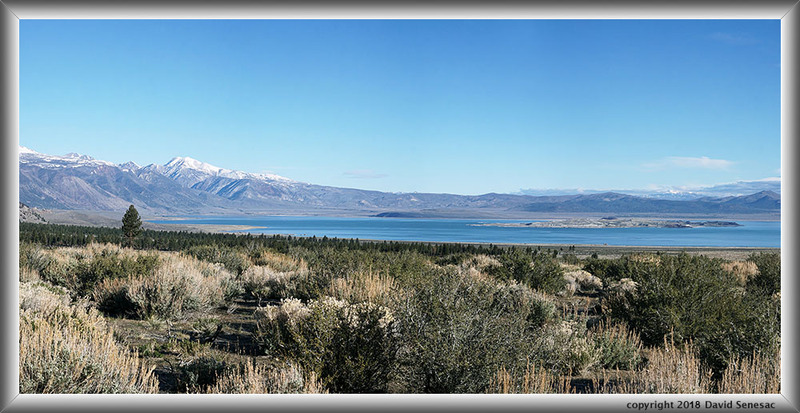 The south Mono Lake alkali shores have extensive areas of native grasses and considerable deer hoof prints in sands testify to the presence of those feeding herbivores. Additionally the rich expanses of green herbs in wet areas support a considerable population of rodents that in turn supports many coyotes that howl at times during wee hours of the night as well as carniverous birds like owls, hawks, and eagles. 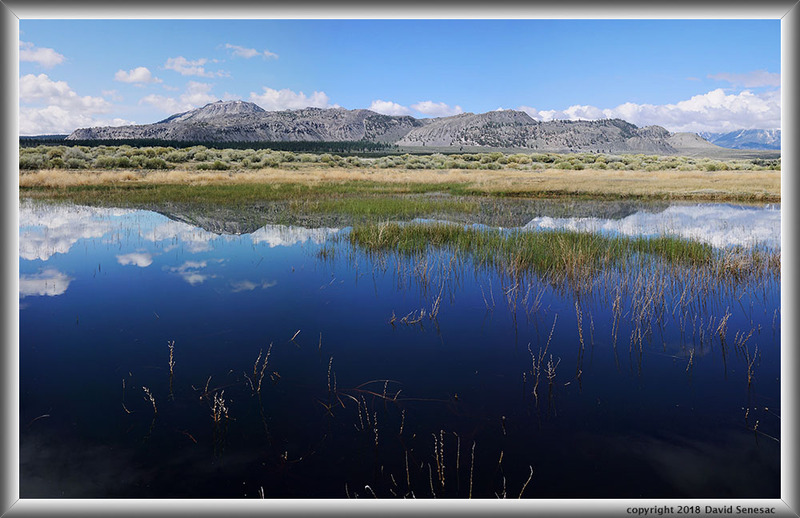 From the same marsh pond, the above image view is due south towards Mono Craters. In a few weeks all of last years blond grasses will be green and the bits of snow on the crater peaks will have long melted. Beyond the grasses are mostly rabbitbush that bloom yellow late summer. And in the distance a forest of jeffrey pines where I often remotely disperse camp. Average May high temperatures at Mono Lake are a pleasant 67F degrees while July and August highs average in the upper 80s. This period of greenery and life in these sagebrush steppe lands in the eastern rain shadow of the Sierra Nevada is brief before unpleasant heat dries much up. 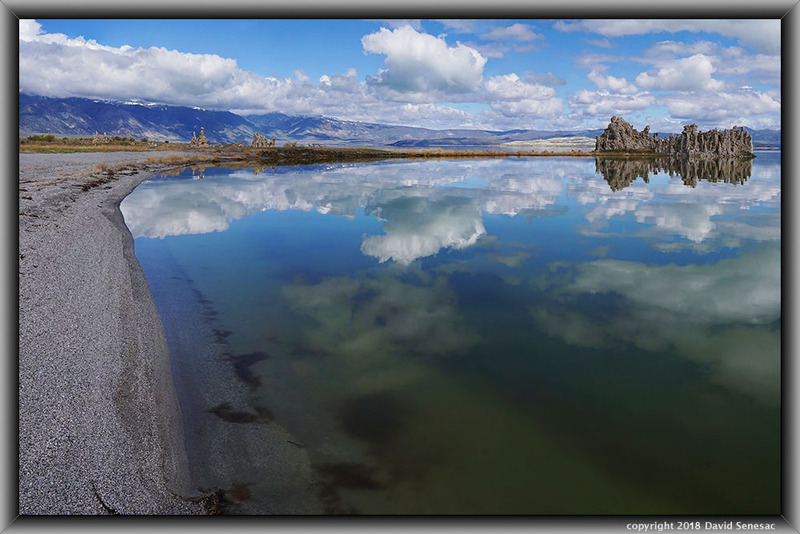 For a couple hours during late morning, I experienced one of the quietest periods along these Mono Lake shores that had waters as far as I could see reflecting clouds, shores, tufas, and background peaks. Thus set up and with some effort at 10:15am captured the above 3 column stitch set. One of the tufa towers had a large osprey nest with 2 mating birds. I noticed they kept looking over in my direction as this uncommon human walked along the shore so I kept well away from that formation. Although the South Tufa parking lot held many vehicles on this weekend Sunday, very few people hike the 2 miles eastward down the shore to this remote location. Even more remote seldom visited shores are another 2 to 4 miles east that I expect to explore in the coming month. By mid afternoon showers across the lake to the north once again developed with minor breezes so I closed up work and explored around farther up the remote shores. Well until showers mid afternoon moved closer to the south shores that chased me back to my vehicle whence I set up a disperse camp along a nearby dirt road. The sun rose again on Monday May 14 with a cloud deck above the lake. Since it was a bit breezy, I didn't bother to run down to one of the sand spit ponds by the lake and instead just captured the above modest single shot image at f18 as warm sunlight hit Mt Lewis and Mt Gibbs. I spent my morning sizing up various sand tufa's I had surveyed over the previous days. And came to the conclusion they do not image well in direct sunlight within the bright volcanic sands that tend to surround them. And shooting in diffuse light they tend to blend into those boring grayish sand backgrounds too without much 3-D impact. Thus my strategy below, of shooting from a low position to put them up against blue sky backgrounds. The below bird head tower was especially bizarre. 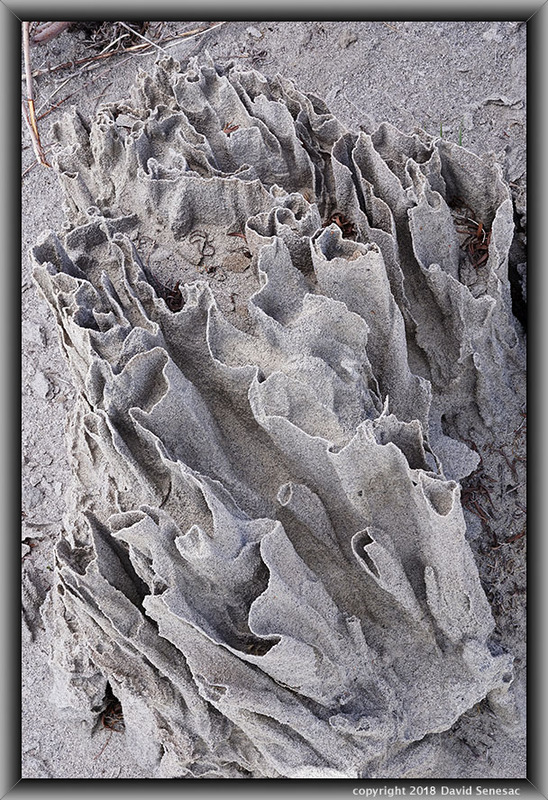 There are many strange sand tufa formations a photographer could spend a lot of time at. Later in the morning it was time to get on the road back home. I'd already made plans to return to Mono Basin after the Memorial Day holiday to give wildflowers in the sand flats more time to develop.